Christmas is coming: but what’s coming for the Iraqi Christians?? 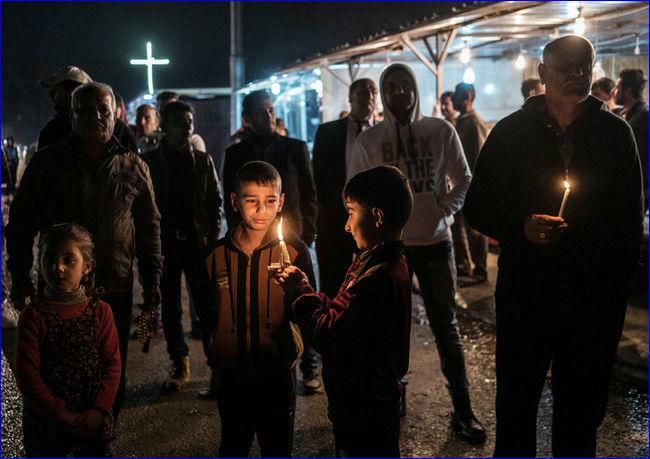 Alice Martins/The Associated Press In this Dec. 1 photo, Iraqi Christians hold candles at a camp for the displaced in Irbil, northern Iraq, as they await the arrival of a convoy carrying the bodies of seven family members who drowned as they attempted to cross the Aegean Sea to Europe. They had fled Islamic State militants from their home on the plains of Nineveh last year and lived in the IDP camp in Irbil since. The members of the family who died on Nov. 17 were identified as 31-year-old Steven Marzina, a baker, his wife, 27-year-old Silvana, and their children, Ingi, 4, and Mark, 7. Christmas is a time of hope and joy, even for persecuted ancient communities on the verge of being wiped out by Islamic extremists in Iraq. Assyrians are a distinct ethnic group. They are among the original indigenous peoples of Iraq, Syria and parts of Turkey. Theirs is a rich and ancient culture that forms part of the cradle of civilization. The vast majority of Iraqi Christians are of Assyrian ethnicity. Within the Assyrian nation, there are many religious denominations, including the Assyrian Church of the East, Chaldean (Roman Catholic), Syriac (Catholic and Orthodox), Presbyterian, as well as Evangelical. The line between the denominations is thin, said Mario Bard, a spokesperson for Aid to the Church in Need Canada, a Catholic organization that provides pastoral support and humanitarian assistance to persecuted Christians around the globe. ACN works with all denominations.It is important to acknowledge that the Assyrian nation predates Islam and even Christianity. The Assyrians walked the Nineveh Plain before the birth of Jesus Christ. And they still speak Aramaic, one of the languages likely spoken by Christ. There is no census information available for Iraq. But it is estimated that there were approximately 1.4 million Assyrians and other Christians in Iraq before a U.S.-led coalition ousted Iraqi dictator Saddam Hussein in 2003. After the invasion, Iraq descended into lawlessness and sectarian violence. Without any Christian militias to protect them from gangs, terrorists and Islamic extremists, Christians were robbed, kidnapped and murdered with impunity. As a result, their numbers began to dwindle. During the summer of 2014, the Islamic State, also known as ISIS, launched a military offensive, capturing large swaths of Iraq, using mass murder, public beheadings and the enslavement of women and girls to subjugate captured territories. An estimated 150,000 Assyrians fled their ancestral homes on the Nineveh Plain. Other areas were also cleansed of Christians, Yazidis and various minority communities.According to Aid to the Church in Need, there are only about 200,000 Christians left in Iraq. So where did the refugees go? “The Christian Iraqis that left the country mainly fled to Turkey waiting to be resettled to the U.S.A. or Canada, depending on where they have family,” said Guy DesAulniers, co-ordinator of humanitarian aid at Development and Peace, the official international development organization of the Catholic Church in Canada and the Canadian member of Caritas Internationalis. According to Caritas, Assyrians and other Christians have also fled to Jordan and Lebanon. According to a few published reports, there are not many Christians in camps for refugees and Internally Displaced Persons (IDPs) run by the UNHCR. So, where are the displaced Christians? A representative for a human rights organization said in an off-the-record briefing that they are aware that Christians prefer to go to churches for assistance as opposed to UN camps, because some Christians say they feel unsafe in the camps. However, the NGO was not able to independently confirm those reports. However, he conceded that there could be a fear factor. “Maybe for Iraqi Christians, it is also the fear of persecution because they are traumatized by the fact they had to leave their home fearing the persecution of ISIS in the name of Islam.”Canada tends to draw refugees from UNHCR camps for government-sponsored resettlement. That means that persecuted Christians, even though they make up a disproportionate segment of the IDP and refugee populations, will likely be under-represented in government-sponsored resettlement initiatives. However, privately sponsored refugees do not necessarily come from UNHCR camps, and that increases the chances of persecuted Christians being resettled in Canada. For example, the Armenian community in Canada is sponsoring Christian refugees from Syria. If Assyrians and other Iraqi Christians aren’t in UNHCR camps, where have they gone? According to Bard, some have been taken in by dioceses in Christian villages in other parts of the country. “You have some places that are still Christian in Iraq,” he said. “No so much anymore, but you still have some.””The Christian and Assyrians are living in the north of Iraq, more specifically in the Christian neighbourhoods of the cities in Kurdistan, like Ainkawa in Erbil,” stated DesAulniers. Aid to the Church in Need is providing emergency assistance to Christians who fled the city of Mosul in northern Iraq. For example, the NGO provided food aid and other necessities of life to 13,500 families in October. Faced with the suffering of displaced Christians, Aid to the Church in Need made the transition from providing just pastoral support to also delivering humanitarian relief to the persecuted. “Because if we don’t, nobody will,” Bard said. That doesn’t mean that they have forgotten about the brutal murders of their families and friends by Islamic extremists. “Of course, they feel very enraged sometimes,” Bard said. Even in times of conflict, persecution and suffering, Christmas brings joy to the faithful. “Even the worst conditions will not prevent them to attend the churches and celebrate Christmas,” DesAulniers said of displaced Iraqis. Ten years from now, will there be any Christians left in Iraq to celebrate Christmas? “That’s another good question,” replied Bard. And he said that ACN estimates that there won’t be any Christians left in Iraq within five years, if current trends remain unchanged.